It's pretty safe to say that the humble lip balm is probably one of the understated beauty products which we will own multiples versions of. I'll be the first to admit it, I can't be without lip balm - they're beside my bed, in my handbags, in the car, on my two desks at work, you get the picture. Whenever I'm run down, feeling ill or stress, the first thing which suffers is my lips and the only product which will ever sort them out is a thick layer of their Relief Cream. Over the last few weeks I've been trying some of their newer releases and I've managed to find some new firm favourites. Out of the products I've been trying two are old faithfuls - their Lip Brilliance in Blushing (£2.59) which adds a sheen of colour to the lips. This is ideal for work, as I can never be bothered to wear lipstick, however if I want some colour adding to my lips I have the option. Personally out of all the range, I do find this to be slightly drying on the lips. However in order to overcome dry chapped lips, I'd recommend reaching for their Intensive Moisturiser Hydrating Lip Cream (£2.65) - this does leave white residue while it soaks in, so bare that in mind when you use it. Normally I prefer to use this on a night in bed. They've recently released a cherry scented version of this, which actually smells of cherries. Personally I prefer the original version, however both contain bees wax and shea butter to moisturise. Also it contains SPF - win win. 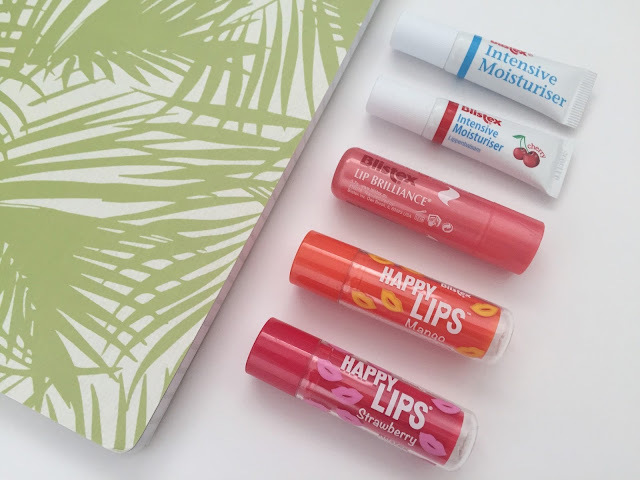 The newest releases are their Happy Lips range (£2.49) which comes in Strawberry and Mango. Anything mango scented is a winner with me and I always find that with fruit scented products it can be hit and miss as to whether it actually smells like the product itself. Personally I love this, the strawberry not so much, purely because I don't like strawberry scented items. These are similar in formula to the Lip Brilliance but are very hydrating on the lips - a winner with me. Are you a fan of the Blistex range? What's your favourite? These sound so great for the price of them too! Thanks for sharing!